This is my second month as a member of the Martha Stewart Cupcake Club! I was super excited to start on my Welcome Autumn: Pumpkin Series, and was thinking about doing a pumpkin cupcake when I realized that this month's cupcake was a pumpkin spice cake! How perfect! But instead of the recommended cream cheese frosting, I set out to make my own Pumpkin Swiss Meringue Buttercream. Yum! The recipe called for super fragrant spices like cinnamon and nutmeg. The batter was a beautiful golden color and produced beautiful golden cupcakes! They smelled delicious! Next, onto the buttercream. I really greatly dislike super sweet frosting. And I think this is the reason why some people don't like cupcakes. Ever since discovering the Swiss Meringue Buttercream, I've used it as a base to create buttercream of all varieties: apple, salted caramel, blueberry, and now pumpkin! It always comes out tasting like heaven, regardless of what flavor it is. I've converted many cupcake haters with it~! So many people have told me the same thing: that they hated cupcakes because they're so sweet...until they tasted mine. They end up eating the entire 2-3 inches of icing piled on top! This buttercream is a lot more work than regular frosting but it's so worth it! It's light, fluffy, and subtly sweet. The subtle sweetness really allows for the flavors to really come out and enhance the overall taste of the cupcake. I urge all of you to try it at least once! Please go to the Salted Caramel entry for detailed instructions on how to make this buttercream. First, prepare the pumpkin filling that goes into the buttercream. Use regular puree (not the pumpkin pie kind), and heat it up in a small sauce pan on low heat. Mix in butter and spices until it simmers and turns a deep amber brown. Chill in the fridge for about 2 hours. It needs to be cold when you use it in the buttercream. When the pumpkin filling is ready to go, make the buttercream. (See salted caramel entry). Combine the buttercream and the pumpkin filling. Mix on low for about 30 seconds until well incorporated. You'll get this gorgeous golden buttercream! It'll have a slight sheen to it. This will give you really beautiful swirls of frosting. Now frost and decorate to your heart's content! And now, I will proceed to give you a step by step description of how I decorated each one! 1. Beware of Poisonous Cupcakes! I got these super cute cupcake liners and skull toothpicks at Michael's. They came in a package of 24. Super menacing, aren't they? 2. Haunted House with a Creepy Moon and Fence~! I thought these were super cute! I also got these in a package at Michael's. They come with 12 cupcake wrappers, 12 moons, and 12 haunted houses. First, wrap the creepy fence around your cupcakes. Then, frost and insert the toothpicks! I had so much fun with these! When the wrapper itself was fully assembled, I made some black spider cut-outs and glued big white rhinestones on them. Then I used mounting tape to stick them onto the wrapper, so that they would pop out of the wrapper, as if they really were crawling up the cupcake. Lastly, I placed plastic spider rings on the frosting! For the black cupcake wrappers, I used orange spider cut-outs and used green rhinestones! 4. The Pumpkin Patch Cupcakes! Top Left: Two different ink pads- one in black, and one in "watermark." The watermark ink pad is super cool. It's basically a clear ink that darkens the color of the paper wherever you stamp it, thus creating a "watermark." Cool, huh? Also, there are two different types of embossing powder- one in clear and one in sparkling white. The clear one will bring out the color of whatever color ink pad you use. The white sparkly embossing powder will make your stamp image, well, white and sparkly! Top Right: An embossing gun. Embossing is really cool. I'm sure you've all seen the effects of embossing, but never knew what it was called. Have you ever recieved a cool invitation, where an image or the letters were raised on the page? You run your finger across it and can feel the texture. Well, that's what an embossing gun will do for you! It makes everything super fancy. Bottom Left: Pumpkin stamps, craft scissors, and double sided scrapbooking tape. Bottom Right: Mounting tape and toothpicks. Mounting tape is a super thick tape that will make whatever you're sticking pop off the page. Here's how to emboss! First stamp your paper. Then, before the ink dries, quickly sprinkle the embossing powder over the stamp. Clear the excess powder off of the page- you can see that the powder has stuck to the stamped design and nothing else. Run your embossing gun over the image for about 30 seconds. The powder will melt, creating a shiny black pumpkin image that's raised off of the page! It's super cool! For the black pumpkins, I used a black stamp pad with clear embossing powder. For the white pumpkins, I used a watermark ink pad with white glitter embossing powder. Next, I cut my stamp images out with the craft scissors and "mounted" them onto squares of black and orange card stalk. Then I added a back to them and inserted toothpicks! Done and ready to frost~! I was fully ready to make marzipan pumpkins...I even bought the marzipan! But I saw these at the grocery store and couldn't help but to use them! They're so cute- pumpkins for my pumpkin patch! These cupcakes were SO delicious. In fact, I think they trump my apple cupcakes which, at the time, I thought were the best cupcakes EVER. There's been a huge debate at my house about which ones are better. Hubby insists that the apples ones were the best, while I really love these pumpkin ones! The pumpkin buttercream is so smooth and silky.. and full of sweet pumpkin goodness! Note: It's super important to allow these cupcakes to warm up to room temperature before serving, should you keep them in the fridge overnight. Click HERE for all recipes. Too cute, all you decorations are amazing!!! I used the candy pumpkins also; all your cupcakes look so professional. Your decorations look amazing! I don't think you went overboard at all. I'm always impressed by how artsy/crafty other people are! If you're not a professional cupcake decorator, you should be. these are just gorgeous! Almost too beautiful to eat. And I will definitely try your frosting recipe. WOW WOW WOW!! Those decorations are beyond adorable!! Love them! Your cupcakes seriously look awesome!! You did a great job! All I can say is wow. I think you win the award for most awesome decorations. You really took these to the next level. Your frosting sounds wonderful too. Thanks for baking along with me this month. Judy - you hardly did a thing. They don't even look finished! :) Wow... you are one amazing baker! I'm in awe - those are fabulous.. and I LOVE your buttercream variation - who would have thought? Those liners are workd of art - truly. Nicely done!!!! These turned out amazing! I love your cupcake wrappers. I'm not that ambitious. Love them! Great job! Oh my, how creative you are!! The frosting looks amazing, makes my mouth water! I have not one single creative bone in my body, so you can imagine the state of shock that I am in seeing all this. Yes, shock at the idea that someone can be so creative in one blog post, with one assignment, on one recipe! You are over-the-top. You win this week, no doubt about it. Very fun to see all this. Do not, I repeat, Do Not visit my blog ever again...I can't stand the humiliation! LOL! Great job...really fantastic! Martha should see this post! Wow. There are no words for how amazing your cupcakes look!!! You seriously put Martha to shame with these cupcakes!!!! You are sooo crafty! I love the wrappers... love them! I wanted to use your wrapper pattern, but I was lazy... so I did royal icing decorations instead. Oh my gosh, girl! You went all out! These are just amazing! Fantastic job!!! Wow. So much work and it all paid off. Gotta try that frosting. I love IMBC and SMBC, too. Wish you were my neighbor..we could scrap and bake together! Wow - you have some amazing decoration how-to's - I'm going to come back when I have more time and learn how to make the cupcake wrappers. I totally dig crafty stuff (and so does my 12 year old), and it's always fun to try new stuff. Learning to make buttercream is on my list, I've got to try it one of these days. Wow!!! Well done--your decorations are amazing! You have taken this to whole new level and inspired us all. Great job!! You are so creative. Love the cuppy holders you made. Sooo cute. And love the frosting you 'created'. You always have such awesome cupcake decorations -- so fun! I totally agree with you about sweetness of frostings. I love the little liners and the toppings! These are so beautiful! Awww, I miss having a Michael's craft shop around...Just one of the many many little home comforts I wish I could have brought over with me. Great ideas with the decorations AND the frosting! Wow, great pictures and decorations! Wow, you went all out, and they are beautiful! What the perfect Halloween treat! You turned a delicious cupcake into a work of art! I also love the swiss meringue buttercream. It is so worth the work! Love your blog! everyone- thanks SO much for all your words of encouragement!! it makes this blogging thing all so worthwhile! i'm glad i could provide some inspiration to everyone! =) you guys rock!! Love, love, love this post... totally adorable! I do believe we are culinary sistas! LOVE your blog!! PS - funny, I've never cut my eggplant lengthwise... maybe next time ;). WOW!! Those cupcakes are FABULOUS!!!! ;-) I applaud your creativity and patience in making all of those cute little lines. 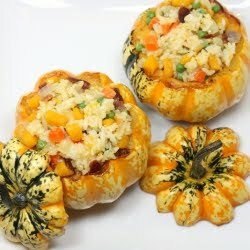 These are darling and they look so delicious! I can't get over how talented you are! Oh my word, you went so above and beyond the call of duty here!! Your cupcakes are spectacular! I think you need to start charging people and selling them :) The frosting sounds really good - I'll have to give it a try this fall. WOW!! Ok, I'm definitely trying your frosting recipe - they are some a-mazing cupcakes!! Oh wow - your cupcakes are incredible. And the pumpkin buttercream - sounds even better than the cream cheese kind! I got my orange stripe/swirl liners at either King Arthur Flour online, or Fancy Flours online - my two favorite resources. But I'm going to have to hoof it to Michael's one of these days after seeing your cute decorations! Great work! The flavored Swiss meringue concept is genius. Wow, you've got a lot of talent and patience, not to mention creativity. Looks amazing! I LOVEEEEEEEEEE YOUR HALLOWEEN cupcakes! I'm hosting a Halloween/Birthday Party too and I got some MS cupcakes treats up my sleeve too. Not going to lie, everytime I pass by your blog, I get super hungry. After a whole year of fantasizing about making these (I found your blog early November of 2009) I finally made these for Halloween this year and they were FANTASTIC! Certainly worth the year long's anticipation. These were the moistest most delicious cupcakes I've ever made and the frosting was TO DIE FOR. I'm also not big on sweet frostings but I was literally eating this with a spoon. Can't wait to try more of your recipes!